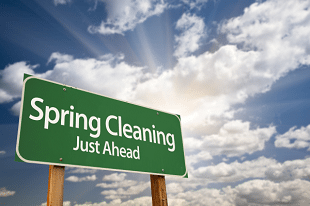 Spring cleaning dates back to the time when the homemakers would take everything outside the house as soon as the weather conditions became manageable. Rugs and mattresses were beat to take care of the grime that built up. The interior of the home was swept as well as mopped eliminating the dust and germs which had collected over the winter season. Today, the job is much simpler than it was in the past. Begin with getting organized. Develop your plan and prioritize in order to stay on task. If there is a lot of crap that you will be removing from your home, order a dumpster bin in advance so there is a super easy way of disposal. Begin with the rooms that are your least favorite to clean. Keep supplies in a bucket which can be taken from one room to the next. Schedule the big event for a day when you’ve got help. Let your children be a part of tasks that are suitable for them. Ask teens and the man of the house to help with the heavy lifting. If you live alone, find a friend who can help you. You should offer to do the same thing for them the next weekend. Having assistance can make the job go smoother and the work will seem easier. The cleaning goes a lot faster using the right tools. Microfiber cloths can help to speed cleaning without just pushing dirt around. Employ a steam vacuum for floor cleaning that does not require chemicals and leaves no sticky residue. Add an extension wand to the vacuum cleaner help with cleaning of cobwebs without making a mess. Other accessories will help you to clean furniture or restricted spaces. The rental dumpster provides you loads of space for all the trash or other things to be taken away from your house. Please do not make the project more complicated than it should be. Microfiber cloths can dust and clean floors without the need to use a cleaning solution. When washing hard surfaces such as bathtubs or sinks, apply the cleaning solution and give it 10 minutes or so to work before wiping down the surface. Add a glass of water to the microwave oven, heat on high for 1 minute and allow the steam to loosen spills. Use Polident tablets designed to clean dentures to scrub toilet bowls quickly. Always have an adequate amount of clean rags to avoid streaking surfaces. With micro-fiber cloths, rinse out in water and wring to clean the wet cloth. Shake microfiber towels used dry for dusting, hold inside a trash or plastic shopping bag and shake to clean. Once the dry cloth can no longer be cleaned by shaking, rinse it in water and use for wet cleaning. One of the keys to minimizing spring cleaning is to be sure your home is clean all year round. Squeegee the shower after every use to avoid build-up. Maintain your weekly cleaning of the home. Line trash cans with a bag everytime they are used. Small kitchen cans can be lined with reused plastic shopping bags. When junk starts to accumulate in your house or garage, get a rental dumpster and eliminate unneeded clutter. Spread cleaning activities throughout the week with a few moments spent on a daily basis to keep the home looking awesome all the time.